First day of my summer holidays and my girlfriend Elsa and I are driving down to the Roussillon to spend the weekend at her family estate Domaine Eternel. During the weekend we check on the vineyard progress. Up early to drive to Girona airport just over the border in Spain to catch a 2 hour flight down to Jerez de la Frontera, the heart of sherry country in Andalucía. We can see that we are close to landing as the famous vineyards with their bright white ‘Albariza’ soils (a porous and lime-rich soil) appear below us. We land around midday and drive 20kms south of Jerez to the coastal town of Cadiz where we are staying. Jerez is a lovely place but being the month of July the inland towns such as Jerez are normally 35ºC+ by lunch time, with no wind! 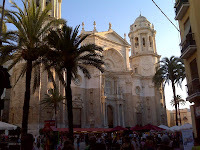 So we sensibly decided to stay in Cadiz which is 5-10 ºC cooler due to the Mediterranean Sea breeze. We spend the rest of the day exploring the old town of Cadiz. Today we explore the ‘Sherry Triangle’. The sherry triangle is made up of the points of three towns; Jerez de la Fronterra (inland), Sanlucar de Barrameda (on the west) and El Puerta de Santa Maria (south west of Jerez). It is in these three towns that you will find the famous sherry ageing cellars with each town producing a unique style of sherry due to its temperatue, humidity and proximity to the sea. 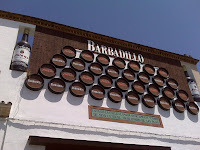 First stop is Sanlucar, the home of Manzanilla dry sherry where we visit bodegas Sandeman and the vast cellars of Barbadillo. Their buildings (in fact, streets!) are painted in their distinctive colours of white and brown and it seems like they own half the town. We then stop off for a look around the old port of Santa Maria before heading back to Cadiz for a well deserved swim. This evening we are being entertained by the one and only Bob Dylan who is performing a small concert in Jerez, personally I can’t think of a better match to ice cold Fino than Dylan live. 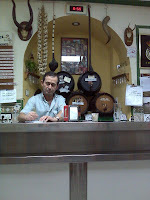 Today we have a Bodega visit at the legendary Alvaro Domecq Bodega in the centre of Jerez. I was introduced to the guys from this Bodega at the London Trade Fair by Jean-Marc Sauboua in May and they invited me for a visit the next time I was in the area. 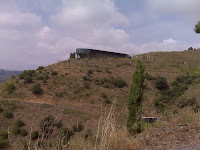 The owners also have a winery in northern Spain to which Jean-Marc consults. Therefore the red carpet came rolling out for my arrival (thanks JMS!). 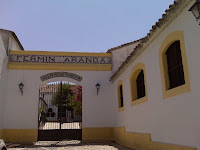 We arrive in Jerez at midday and it is already 34ºC, we are greeted by Maria Jimenez who leads us down the narrow streets to the entrance of the Bodega, where we are passed into the hands of export manager Jorge Sosa and the winemakers Rafeal García and José Antonio Portales for a tour and tasting of the bodega. After the cellar tour (now lunchtime) we find ourselves situated at the tasting bar laden with heaps of succulent ham, aged Manchego cheese and of course every style of sherry that they produce. I am suddenly called away to taste some samples on the behalf of Tony Laithwaite in the tasting room. I am hurried through the door which house all the offices and professional tasting areas. Walking down the corridor I peer into the third office along (door wide open) and I see the man himself Senor Alvaro Domecq leaning back in his chair, feet up on the desk, cigar and a glass of cold Fino in his hand! Once in the tasting room Alvaro suddenly appears in a chest out stance (he used to be a top bullfighter) to say a quick hello and to introduce himself to me. We finish the 2 hour tasting, most of the cheese and ham and finally say goodbye. These are excellent Sherries so if you can get hold of any of the wines these guys make I would highly recommend that you try them. For dinner we venture in to the old town quarters of Cadiz to find some traditional dishes to go with the local dry sherries. After walking around the narrow streets we stumble upon the ‘Pena Cazadora’. This is a bar restaurant owned and supplied by the local hunting group. Little did I know but this was to be the highlight of my holiday. As we enter the bar we notice all the stuffed stag, boar and ram heads on the wall, the place is bustling and food is being thrown out from the bar to the customers, the smell is incredible with wonderful rich aged ham and game hanging from the ceiling. Luckily Elsa speaks perfect catalan so we get off to a good start with the barman and order a Manzanilla, he shouts ‘Casa’ and turns to the house barrels behind him to pour two glasses of sherry. The Manzanilla is absolutely superb (surprised to say the least), then the menu scribbled on a chalk board is barely readable so we order blindly. We take a seat at a nearby table, soon we realize there is no table service and all the shouting at the bar was infact for us to go and collect our food that was piling up on the bar! A huge plate of jambon, chunks of cod in bread crumbs and lemon, wild boar black pudding and the tiny flat white shelled snails in a sherry/onion /garlic sauce were divine, this was followed by succulent chicken in a ripe tomato sauce and 34 month old manchego to finish up (plus a couple of house Manzanillas!). The food was marvelous with the dry sherry and convinced me yet again that it is time to revisit this very adaptable and tasty style of wine once more. Back to Girona and then spend the weekend in the Roussillon in France. We are off to Spain again to spend the week in the fishing village of Cadeques in northern Catalonia famed for being the home of the Spanish artist Salvador Dali. This is a strictly no wine week (or Elsa might kill me). However, the village is situated in the fantastic small DO of Emporda. Emporda is a slate soil region making wines from Grenache, Carignan, Cabernet and Syrah and there are some fantastic wines to be tasted from here. So I will hopefully get to try to taste a few of these with dinner this week! After a week of sea, sun and no vineyards in sight we decide to go down to the Spanish DOQ of Priorat to see some friends and visit some bodegas. Priorat DOQ is situated about 150km south of Barcelona and has rocketed to stardom especially in the US (Robert Parker helped). It now has huge outside investments being made and in turn the construction of modern bodegas and the planting of very expensive terraced vineyards. Priorat DOQ is an area made of pure slate soils and can be found inside the DO of Monsant, all vineyards are cultivated on incredibly steep terraces and the Grenache and Carignan are the king and queen of the grape varieties grown here. The area is unique mainly due to the remarkable temperature difference between night and day. The temperature on average falls and rises17 ºC in 24 hours and it is this that enhances the complexity during the grape maturation. This explains why Priorat wines have this immense strength but remain elegant and fresh on the palate. We are staying the lost town of Falset in our favourite hotel ‘La Fonda’. The hotel has not been changed since the 1930’s and is 35euros the night for 2 people. The rooms are huge with large doors (accompanied by a key the size and weight of a petanque ball!) and a beautiful overgrown private terrace. It is a ‘no fuss’ hotel and comforts are minimal but the place is spotlessly clean and very friendly. The town of Falset is home to people who are involved in the wine trade so it is a very local village and only Catalan spoken (no Spanish). There are some lovely restaurants, with our favourite being the Baravins – a modern restaurant with a great wine list – we had a lovely DOQ Priorat Rene Barbier Clos Mogodor 2004 with dinner. We meet up with our friend Stephan Lismon for coffee. Stephan is a Flemish Belgian who has lived in Catalonia for 14yrs and represents many of the top Bodegas as export manager. He takes us first to Mas Blanc (photo of vines or bodega) which is a 12ha estate adapted to organic and biodynamic methods and with a modern winery. 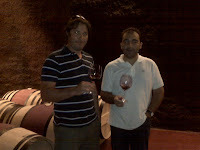 We taste two very good wines the 2005 ‘+7’ and the 2004 ‘Balcons’. After lunch we are on the winding road from Falset to Porrera trying to find the winery Ferrer Bobet. My friend Norrel knows the owner and has organized the visit for us all and the only background info I have is that he told me “it will blow your mind”. Bend after bend passes by and no sign of life let alone a winery, then out of blue there is a UFO sticking out of the mountainside. After taking the private road up to the Bodega which sits at 600m above the main road we are met by Isabel Fortuny at the winery door. The place is amazing and the two owners Sergi Ferrer and Raul Bobet and spent a ridiculous amount of time and money to construct this winery. It has all the bells and whistles such as huge drive-in fridges to store the grapes whilst waiting to be processed, gravity lifts and cranes, tiny temperature controlled oak and stainless steel tanks, various underground barrel stores, more electric Star Wars-style glass sliding doors than you can shake a stick at, and an amazing bay windowed control bridge (a la Star Trek) tasting room!! After the cellar tour we are showed into a big 4x4 armoured type land Rover and chauffeured out of the winery up towards the vineyards only to stop at a huge gate. As the driver punches in the code and the gates swing open I have a very weird ‘Jurassic Park feeling’! We now get see the vineyards all trained on ‘echalas’ as in Côte Rôtie. 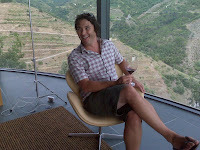 After more doors and codes we arrive back at the winery and into the tasting room to taste the 2006 Ferrer Bobet, the room and views are so spectacular that I pay little notice to the wine for at least ten minutes. The wine even though extremely young is very, very good indeed which is refreshing to see from a winery with too much money! On our way back to France we stop off at Mas Perinet, another big winery of the area set in 300ha of land (80ha of vines) with a modern winery. 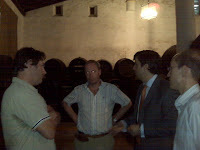 Josep Serra the director greets us and we have a wonderful tour and barrel tasting followed by an extremely long lunch. The wines are very good and there are a lot experiments going on here including potential new varieties, barrel makers and different yeast strains. Mas Perinet have also purchased a property in the DO Monsant area where they are planting vineyards and restoring an old farm back to its original state in order to house a rustic style winery and hotel. Back to real work today and I am meeting Thierry Cazach the director/winemaker of the Caves de Maury to discuss the 2008 vintage for the President XV and G.G. We go through the details and then I go out with Arnaud the viticulturist to have a look at the progress of the vineyards. The vineyards are looking good and I estimate 4-5 days behind last year. Today I’m back in the Bordeaux and lots of work to do at the Chai Au Quai. The next jobs are the bottling of the Sauternes 2006 and the St.Emilion 2006. Hi Mark, a jolly nice wine trip it seems. I covered in my blog also the 24th of July (http://www.festis.cat/page39/page39.html), now just Elsa should write hers.